Daman Hongren (Chinese: 弘忍) (Wade-Giles:Shih Hung-jen; Japanese: Daiman Konin) (601 - 674) was the fifth Chan (Buddhist) patriarch in the traditional lineage of Chinese Chan. He is said to have received dharma transmission from Daoxin and passed on the symbolic bowl and robe of transmission to Huineng, the sixth and last Chan patriarch. As with all the early Chan patriarchs, many of the details of Hongren’s life are uncertain and much of his biography, recorded by historians long after his death, is largely legendary. Hongren was born in Huangmei and left home as a youth to become a monk and study under Daoxin, the fourth patriarch of Chan. After Hongren, Chan Buddhism split into two schools led by two of his students, a Northern School under Yuquan Shenxiu (玉泉神秀) (606?-706) (Wade-Giles: Shen-hsiu; Japanese: Jinshū), and a Southern School led by Dajian Huineng (慧能 or 惠能; Pinyin: Huìnéng, 638–713). Each of these schools regarded their leader as the legitimate sixth patriarch of Chan. Hongren emphasized meditation practice, teaching that the Pure Mind was obscured by “discriminating thinking, false thoughts, and ascriptive views.” and that Nirvana naturally arises when false thoughts are eliminated and a constant awareness of one’s natural enlightenment is maintained. A compilation of his teachings, the Treatise on the Essentials of Cultivating the Mind, (Wade-Giles: Hsiu-hsin-yao lun; Japanese: Shūshinyō-ron) is the earliest collection of the teachings of a Chan master. After Chan Buddhism had been established in China for several centuries, a lineage of Chan patriarchs was developed, originating with Bodhidharma, the 28th Indian patriarch who is said to have brought the Chan sect into China during the reign of Emperor Wu (420 – 589). Bodhidharma became known as the first patriarch of Chan Buddhism; his disciple Huike (487-593) as the second; Jianzhi Sengcan (d. 606) as the third; Daoxin (580 – 636) as the fourth; and Hongren as the fifth. As with all the early Chan patriarchs, many of the details of Hongren’s life are uncertain and his biography, recorded by historians long after his death, is largely composed of legends which reinforce Chan teachings..The following biography is based on Chan traditional sources. Hongren was born in Huangmei with the family name Chou. One source, the Leng-ch’ieh shih-tzu chih (Records of the Teachers and Disciples of the Lankavatara) says that his father abandoned the family but that Hongren displayed exemplary filial duty in supporting his mother. However, at the age of either seven or twelve, Hongren left home to become a monk and began his studies under Daoxin. The following legendary meeting between Daoxin and Hongren is recorded in the Transmission of Light (Japanese: Denkoroku), by Keizan Jokin Zenji (1268-1325), a koan collection of 53 enlightenment stories based on the traditional legendary accounts of the Zen transmission between successive masters and disciples in the Soto Zen Buddhist lineage from Shakyamuni Buddha to Japanese Zen Master Ejo, who first brought the Soto Zen teaching from China to Japan. Hongren stayed with Daoxin until the latter’s death in 651. Presumably, he was with Daoxin when the master was at Ta-lin ssu on Mount Lou and followed him to Mount Shuangfeng, one of the “twin peaks” of Huangmei. Later tradition has it that Hongren, after Daoxin’s death, moved the community of monks to Dong-Shan, “East Mountain,” the easterly of the “twin peaks.” The teachings of Daoxin and Hongren became known as the “East Mountain Teachings” (tung-shan fa-men). Although the Records of the Teachers and Disciples of the Lankavatara claims that Hongren’s father abandoned the family, Chan scholar John McRae points out that Hongren’s family was probably wealthy and prominent locally, because his residence was converted to a monastery. The mention of Hongren doing menial labor would only be of significance if this were unusual, indicating that Hongren was of upper-class birth. After Hongren, Chan Buddhism split into two schools, a northern branch under his disciple Yuquan Shenxiu (玉泉神秀) (606?-706) (Wade-Giles: Shen-hsiu; Japanese: Jinshū), and a southern branch led by Dajian Huineng (慧能 or 惠能; Pinyin: Huìnéng, 638–713). Each of these schools regarded their leader as the legitimate sixth patriarch of Chan. Hongren was significant in the development of early Chinese Chan.<McRae, 1986:40"/> The teachings of both Daoxin and Hongren became known as the “East Mountain Teachings,” but Hongren was the more prominent of the two. He was held in high esteem by later Chan figures in the ancient capital cities of Chang'an and Luoyang in the early eighth century, when Chan moved from a rural base to the center of Chinese power in the major urban areas and the imperial court. The East Mountain Teachings were seen as the “authentic” Chan Buddhist teachings, promoted by Hongren’s student, Shenxiu (神秀, 606?-706), the most prominent Buddhist monk of his time. Hongren’s significance can be noted by the fact that a compilation of his teachings, presumably shortly after his death, the Treatise on the Essentials of Cultivating the Mind, (Wade-Giles: Hsiu-hsin-yao lun; Japanese: Shūshinyō-ron) is the earliest collection of the teachings of a Chan master. Hongren continued Daoxin’s tradition of establishing monastic Chan communities in which the monks worked in the fields and developed practical and administrative skills as well as engaging in meditation practice. Chan practice now extended beyond meditation to all aspects of daily life. 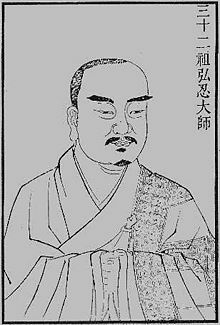 Although Hongren’s students included Vinaya specialists, sutra translators, and Lotus Sutra and Pure Land devotees, Hongren’s teaching focused on meditation practice.According to the Treatise on the Essentials of Cultivating the Mind, Hongren's basic teaching was that the Pure Mind was obscured by “discriminating thinking, false thoughts, and ascriptive views.” Nirvana naturally arises when false thoughts are eliminated and a constant awareness of one’s natural enlightenment is maintained. He also taught that the meditator should observe the mental processes within: "View your own consciousness tranquilly and attentively, so that you can see how it is always moving, like flowing water or a glittering mirage. …until its fluctuations dissolve into peaceful stability. This flowing consciousness will disappear like a gust of wind. When this consciousness disappears, all one’s illusions will disappear along with it…"
Hongren’s student Dajian Huineng, one of the most important figures in Chan tradition, is said to have advocated an immediate and direct approach to Buddhist practice and enlightenment, and in this regard, is considered the founder of the "Sudden Enlightenment" (頓教) Southern Chan school of Buddhism. His other famous disciple, Yuquan Shenxiu (玉泉神秀) (606?-706) (Wade-Giles: Shen-hsiu; Japanese: Jinshū), was a patriarch of the 'East Mountain Teachings' (Chinese: tung-shan fa-men), later given the appellation " Northern School" by Shenhui (670-762). He was extremely influential, honored by Empress Wu Zetian (r. 690-705) of the Tang Dynasty, and alleged author of the Guan Xin Lun (Treatise on the Contemplation of the Mind), written between 675-700 ), a text once attributed to Bodhidharma. ”Therefore, the Vimalakirti Sutra says: “Dharmas have no Self Nature and no Other Nature. Dharmas were fundamentally not generated in the first place and are not now extinguished. Enlightenment is to transcend the two extremes and enter into non discriminating wisdom. If you can understand this doctrine, then during all your activities you should simply maintain awareness of your fundamental Pure Mind. Do this constantly and fixedly, without generating false thought or the illusion of personal possession. Enlightenment will thus occur of itself." Daman Hongren, excerpt from Treatise on the Essentials of Cultivating the Mind. ↑ Hung-jen (early eighth century). Treatise on the Essentials of Cultivating the Mind, "One The Way," The DailyZen Journal (May 2007). Retrieved December 17, 2008. Hung-jen (early eighth century). Treatise on the Essentials of Cultivating the Mind, "One The Way," The Daily Zen Journal (May 2007). Retrieved December 17, 2008. This page was last modified on 24 December 2008, at 02:48.